Advance copies Mercy Funk's new album - Feel Good - now available! Look what came in the mail this week! Our brand new album, Feel Good, is hot off the presses, and we're so excited to share it with you that we have a special deal going down! For a limited time, you can snag an advance copy of the CD when you purchase a physical ticket for our June 2 release party from a band member. Click the purple button below so we can set up a day/time/location for delivery! 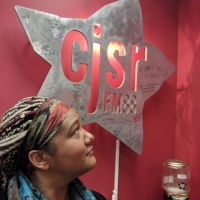 Thank you Rhea March for having us on It Takes a Village on CJSR 88.5 (FM). We had so much fun playing live!If you missed it, take a listen!